when ryan was younger, he used to love making the centerpieces at his church around the holidays. 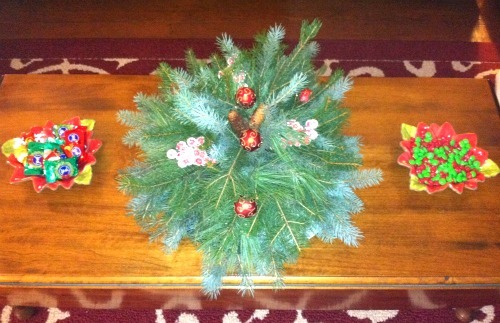 so, for christmas this year, ryan decided to make a festive centerpiece for the coffee table in our living room. (i never knew my husband had this hidden talent!) ryan used fresh evergreen and pine from the trees in our backyard, and we bought the rest of our supplies at michael's for just $6.29! talk about a reasonably priced centerpiece! - decorations such as holly berries, christmas ornaments, etc. and place it in the center of your plate. step 2: cut pieces of evergreen/pine and secure them in the foam. step 3: continue adding layers of evergreen/pine to the foam. step 4: alternate with different types of greenery. step 5: be sure to completely cover the foam with the evergreen/pine. I was admiring the impressive-looking centerpiece when we were at your house on Christmas, but I didn't know that Ryan had made it himself. Very nice! Also impressive was the 2012 desk calendar that Ryan made in memory of your kitty. That was a very thoughtful gift.